Wine sets are essential for any wine lover or connoisseur. You'll have all the right tools you need in one place! Plus you'll look classy in front of your dinner guests. This wine set includes a wine stopper, drip ring, pourer, corkscrew, and leather box to store them in. 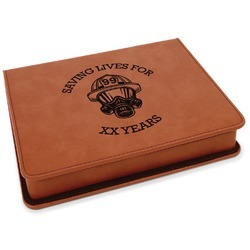 The box is a gorgeous cognac color leatherette material that measures at approximately 7" x 5.5". The inside of the box is a smooth black velvety material. On the bottom of the inside is a foam area with four uniquely shaped indentions to hold each wine tool. The tools fit snugle in each of their designated spots. The wine pourer, corkscrew, and stopper are all adorned with beautiful bamboo accents. The lid easily flips open and closed and stays closed by a small magnet. To care for your wine tool set, simply we recommend using mild soap and warm water on a soft cloth. Gently rub off any dirt. Rubbing alcohol works well for getting rid of some stains or pen marks. Create a beautiful design for the front lid of your wine accessories box. Use a cute saying or put your name. Whatever you choose will be laser engraved into the lid of your box. The result will be a black color. Make your night perfect with the perfect accessories. 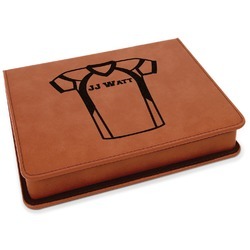 Take a look at our wine totes, wine glasses, and coasters. Make it a night to remember.